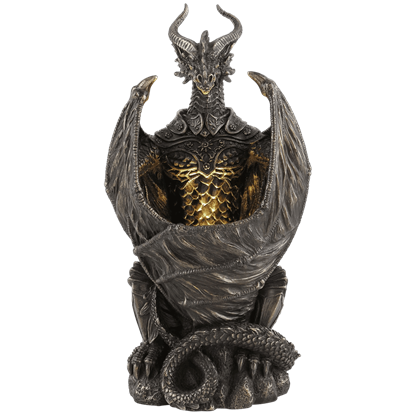 Not only are dragon lamps and lighting functional additions to home decor, they are also great for showing off your love for all things dragon. Our dragon lamps come in a variety of shapes made to fill different roles, so our selection ranges from hanging lamps and wall lamps to table lamps and beyond. Some of our dragon lamps are grand things that feature impressive dragon styling, full-figured dragons that stand tall and proud holding spheres of light that illuminate the room. Some of these are dragon wall lamps that depict dragon heads holding light sources, while others are perched on wall displays that show off great medieval style. Others are hanging lamps meant to be suspended from the ceiling. Still others are great table, desk, and mantel displays. Some exhibit large amounts of light while others, like our smaller LED lamps and tap lights, are more suited as accent lights or as night lights. Like dragons themselves, the dragon lamps offered here come in all different shapes and sizes. 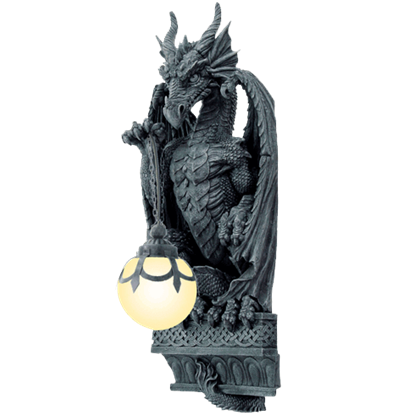 So if you are looking for your next dragon collectible, why not take a moment to browse, as you might find just what you are looking for and more in one of our dragon lighting options. With its wings hunched behind it, the stone colored dragon gazes down at passersby, its scaly tail curled around itself and a glowing orb resting upon its back. The Crouching Dragon Wall Lamp displays this scene in striking detail. This brightly colored dragon seems to have found a treasure worth defending. 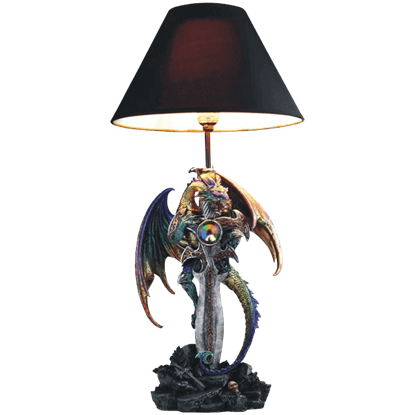 This Dragon and Dagger Table Lamp is a beautiful fantasy decor piece that features a dragon clinging onto a dagger with a lamp resting atop the pommel. 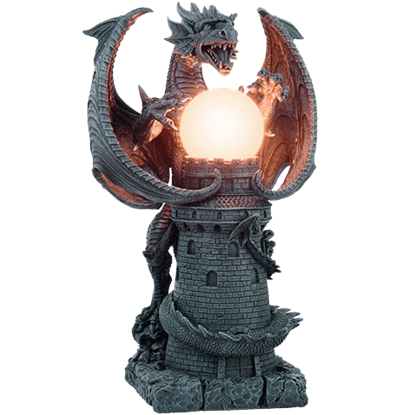 Show everyone who the true king of your castle is with the Dragon Castle Lamp. Nothing beats the fierceness of a dragon when it comes to fantasy creatures, and the dragon depicted here proves it with incredible detail and style. 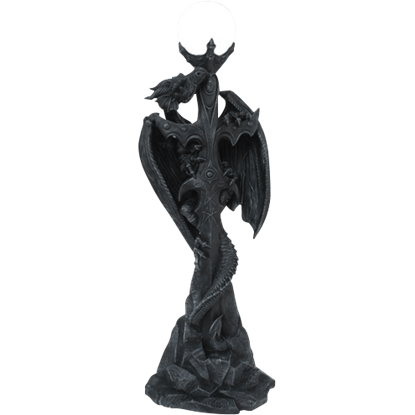 If your room needs a striking focal point that your guests will never be able to forget, then look no further than this Dragon Dagger Floor Lamp. 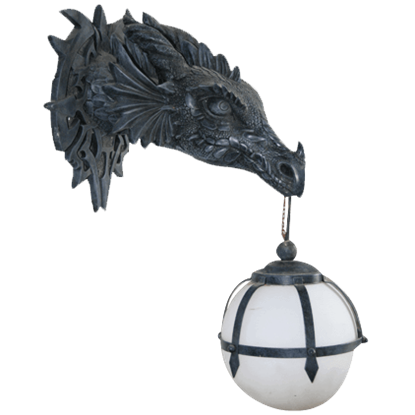 Any collector of dragon decor will thrill at the sight of this stunning light fixture. When a dragon is about to breathe fire, its throat glows brightly. Just imagine how well two dragons could light your house. 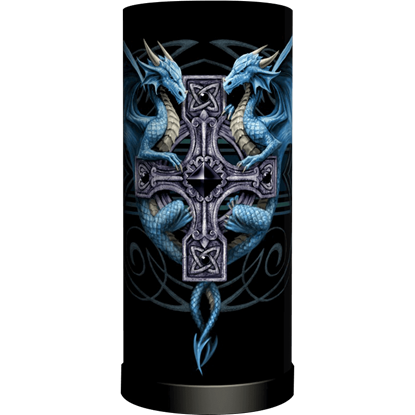 With the Dragon Duo Round Lamp, you can find out without having to worry about the burning flames that come next! 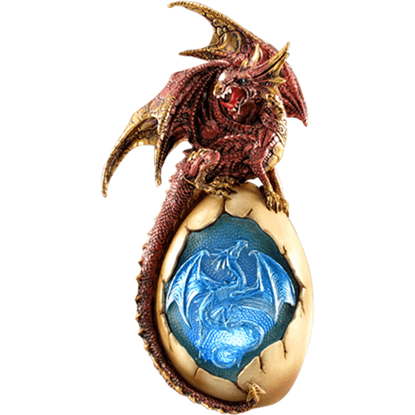 Before it hatches, a dragons egg glows from the inside with the fires of the beast within. In the meantime, though, that glow makes for a pretty nifty lamp. 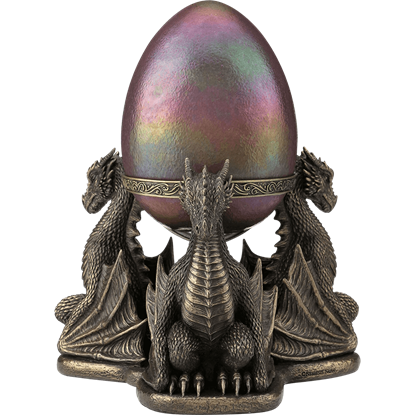 With the Dragon Egg Lamp, you can utilize this magic glow to light your home. Dragons have a reputation for being bloodthirsty fire-breathing beasts, but if you catch them alone with other members of their species, they can be quite loving and helpful, as displayed by the Dragon Egg LED Light. With a glowing orb suspended from one claw, the dragon stands watch over all who dare to pass by. Made of cold cast resin hand painted to resemble stone, the Dragon Hanging Orb Lamp features this fantasy creature in stunning detail. 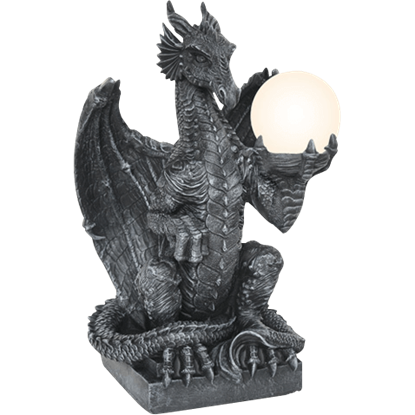 Embrace the timeless style of medieval fantasy in your home with this Dragon Orb Table Lamp. Clutching a glowing orb in its fist, this grinning dragon gazes onward intently as you use the light that emits from his treasured sphere. 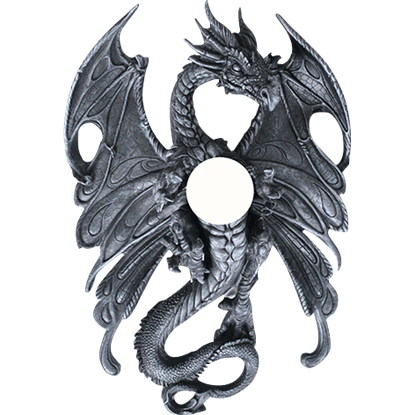 At first glance, this Dragon Orb Wall Lamp might seem like a stunning wall hanging that perfectly shows off your fantasy style. Once you flip the switch, however, the orb lets off a bright glow and works as a functional light fixture! 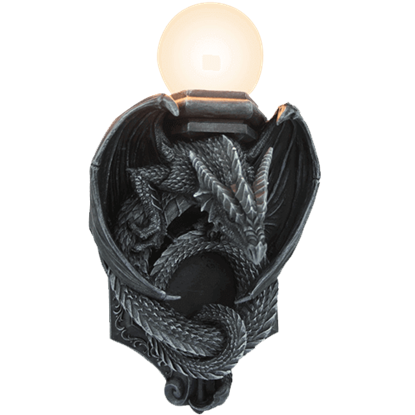 While many dragons prefer to keep to darkened caverns, the dragon in the Dragon Wall Lamp offers light to all in view. The head of the dragon bears the hook from which the round lamp hangs, creating a striking accent on any wall.